DVD to iPod Converter is an extremely easy in usage DVD to iPod converter application intended for iPod Video and Apple iPod Movie. It converts almost any types of DVD to iPod Movie / iPod Video formats. 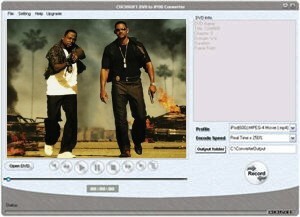 Due to its conversion speed it became one of he most powerful DVD to iPod converters.